With the growing popularity of 1S brushed micro quadcopters, we are seeing more and more options for components: flight controllers, motors, FPV setup. It would make life a lot easier to have a central place where you can look up most if not all of the possible brushed micro quad parts. Last updated 24/03/2016. We will try to keep this list updated regularly, please let me know if there is any missing items. Make sure you also check out our other parts lists. The processor basically determines what software you can run on the micro quad. It might be Irrelevant to some FC such as the Hubsan board, because they come with their own firmware, and you cannot change settings on them (such as PID and rates). FET is the ESC (motor speed controller) of a brushed micro quadcopter. Depends on your choice of motors and propellers, you need to make sure the FET’s meet your current draw requirement. Options of 3.3V/5V outputs for RX and VTX? As it was pointed out by Blaise in the comment AlienWii is discontinued by the original author, and it’s now been taken on by AlienFlight. Also note that the Quanum Pico and the Micro SciSky are actually the same board, just rebranded. Basically there are 2 sizes of brushed motors you can get for micro quad, different by the diameter: 7mm and 8.5mm. They are also sometimes known as 0720 and 0820 motors, the first 2 digits (07, 08) being the diameter class, and the last 2 digits (20) being the height of the motor. Note that brushed motors are consumables just like props, they generally last around 5 to 10 hours of flight time. That might not sound like a lot, but that’s about 100 flights. As they are wearing out they don’t run as efficient as when new, and gradually giving less thrust and shorter flight time. From experience, I would recommend the Ladybird props over others for both 7mm and 8mm builds, because of the cheap price and great durability. They take abuse and very hard to break. They also don’t fly off the motors in crashes. Hubsan props disappear every time I crash and often go missing. For best performance props on 8mm builds you can try some of the Parrot Rolling spider props, they are pretty efficient and generate a lot of thrust (because they are longer). Make sure your FETs support the current draw. Motors show different performance when coupled with different propellers, I try my best to test different combo and here are the data I have gathered so far. There are 2 main types of frames for micro quadcopters, Carbon fibre and 3D Printed. CJMCU is the only FC I have seen that is integrated into a silicon frame. But I am personally not a fan of that because of the vibrations can get into the Gyro/ACC sensors easily. Carbon Fiber frames are lighter yet more rigid and strong, but they tend to be more expensive. 3D printed Micro frames are much cheaper, however with bad design they do break easier than carbon fibre, and even have bending arms that affect flight characteristics. What I found is, for 7mm motor builds, you normally need higher C rating batteries. Low C packs just don’t have the punch and isn’t enough to keep the quad in the air long. 8mm motor builds are a lot more forgiving when it comes to LiPo. Even those cheap, low C rating banggood batteries runs okay (not great, but flyable). Weight is critical to a micro quad, you can feel the difference for every gram you save. Larger battery pack doesn’t necessary give you longer light time because of the increase in weight. The extra weight might even make the quad hard to control. What battery should I get? For 7mm motors builds, the only battery I would recommend is the 300mAh 45C from Hobbyking. Batteries that are heavier than that might have trouble even taking off. 8mm builds are more forgiving and any batteries in the following list should fly fine, but I recommend the 750mAh 35C for longer flight time, or 300mAh 45C for faster, more agile flying. The following RX in the table are all supported by the Taranis (bind directly, no extra TX module required) and majority of the Frsky TX modules. Some FC has built-in spektrum RX, many TX allows you to plug a additional TX module on it like the Taranis or Turnigy 9X, so you can get a Orange TX module, and bind with the Spektrum RX. Depends on what radio system you are planning to run, I guess most people would be running Frsky Taranis, or 9X/9XR with a Frsky TX Module. In that case you should get the Frsky Micro RX (PPM), or the VD5M (PWM). Frsky VD5M Micro RX is an alternative receiver for Frsky users (Taranis), which runs on PWM. Someone left me a comment before saying it’s possible to mod the VD5M to output PPM, but I’ve never looked into that. SPR8 receiver is a full feature radio receiver, supports PPM and telemetry. Weights only 2g (1.5g if shorten wires), and about the same size as the Frsky Micro RX. However this RX only accepts 5V power input, so if your micro quad setup doesn’t have a step up voltage regulator from 1S to 5V, then you can’t use this RX. For FPV setup on Micro Quads, you have two options, one is to buy a readily made setup (FPV combo), the other option is to buy camera and VTX separately. Usually buying them separately and put them together is a cheaper solution. Same requirements apply here for VTX, light weight and takes 3.3V input. 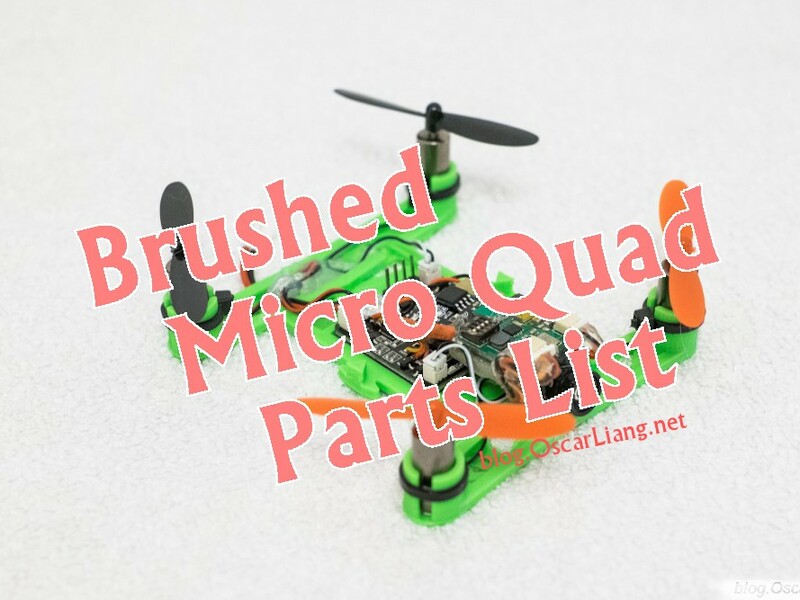 You might be interested in some of the micro quad build examples I posted before on the blog. The Tiny Whoop build is basically an Eachine E010 coupled with a VTX/Camera FPV combo. It became very popular and started by the Horizon Inductrix, but it’s much more expensive than the E010. Check out my build log of the E010 Tiny Whoop. What is the advantage of small brushed quads over small brushless quads like LKTR120? safer, lighter, cheaper and easier to build and maintain. I love your blog, mainly the micros articles. You should probably add the FX758-2 5.8G 200mW Vtx to the list, 3.3v – 5v @2.2grams, less when you remove the metal RF shield, a capable little Vtx with a clean signal. I have stupid question what version of cleanflight i have to flash beef board ?? Micro Scisky : read the reviews at banggood, it have some issues specially binding and motor spinning…. Note that I haven’t tried either the Sparky2 flight controller or the TauLabs Brushed Sparky frame, so I can’t comment on them first hand. But they do look interesting. Note his post is a bit old, so I don’t know if he still sells them. Again I haven’t personally tried this. I have bought a couple of frames form picnicquads and can recommend them. Also, the quanum Pico and the Micro SciSky are actually the exact same board, just rebranded. If you buy a MicroSciSky from Bangood chances are you’ll get a Quanum branded one these days. Good article. You should probably mention that the original AlienWii is discontinued by it’s original maker, and that clones / improvements are in development but not yet widely available. check out http://www.alienflight.com for more info. might also be useful to point people to http://community.micro-motor-warehouse.com for a dedicated micro community. How to Calculate FPV Range with dB?